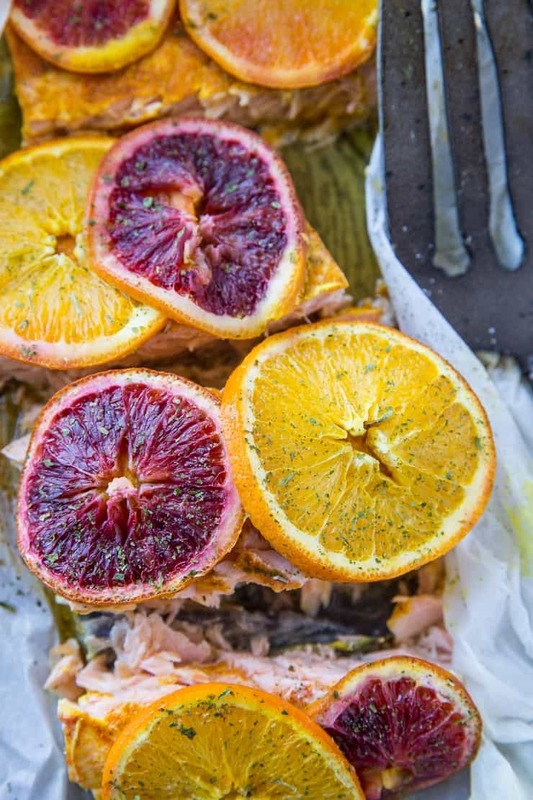 Vibrant, flavorful nutrient-dense Citrus Ginger Turmeric Parchment Paper Salmon. Cooking salmon in parchment paper is quick, easy, and results in beautifully tender fish. Lately, I have been more cognizant about the way I cook my fish and meat. While I absolutely LOVE broiling salmon or cooking it in a cast iron skillet to get that epic crisp, I’ve been trying to cook it at a lower temperature to preserve the integrity of the omega-3 fats. Similarly, when I cook chicken, beef, or pork, I use my slow cooker or pressure cooker more often than not. This to say, when I’m not in a rush to get dinner in my belly, I cook my fish and seafood in parchment paper. This isn’t our first foray into parchment paper salmon here. In fact, the Mediterranean Salmon in Parchment Paper recipe I posted several months ago has been a big hit on the blog! With a little forethought, this is an excellent meal prep method! You can cook a couple pounds of fish at the same time and it only requires a bit more time than broiling or skillet cooking. Because citrus is still looking mighty fine in the produce section, I’ve been using it to flavor my fish and chicken. 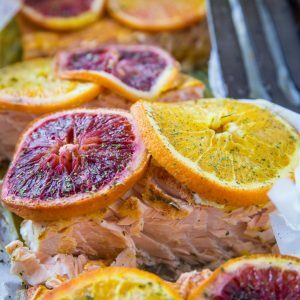 The combination of turmeric and ginger with slices of navel and blood oranges makes for a colorful and flavorful salmon! Preheat your oven! 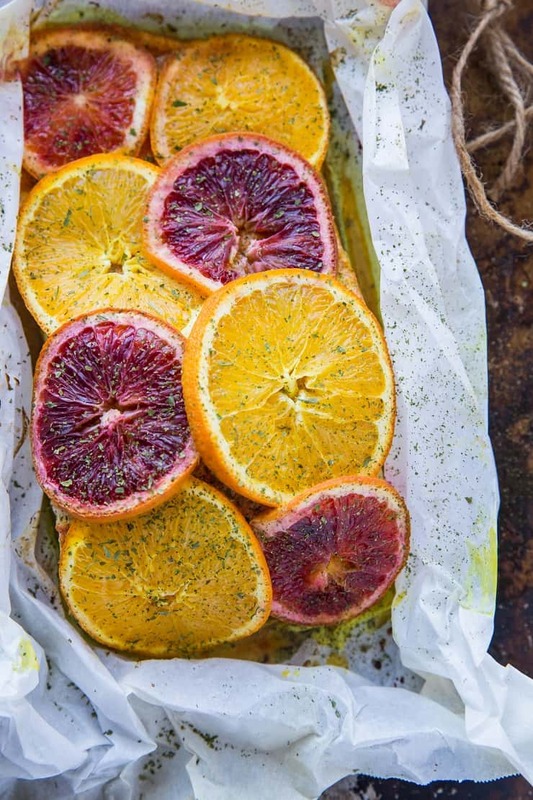 Tear a long sheet of parchment paper off the roll and place it on a large baking sheet. Place the salmon fillet on the center of the parchment paper and sprinkle with spices. Drizzle the fillet with lemon juice (I only use about 1 to 2 tablespoons of lemon juice) and layer the slices of orange (or lemon) on top of the salmon fillet. Fold the parchment paper over the salmon, creating a sealed packet. Use twine to tie the parchment paper shut. Place in the preheated oven and bake for 25 to 35 minutes, until the salmon is cooked through. Serve the parchment paper salmon with your favorite side dishes. I recommend Orange Ginger Roasted Carrots, Roasted Celery Root and Carrots with Parsley and Dill, Roasted Winter Vegetable Quinoa Salad with Cider Vinaigrette, Crowd-Pleasing Roasted Vegetables, or Roasted Vegetable Warm Kale Salad with Rice. Enjoy this citrusy turmeric ginger delight! 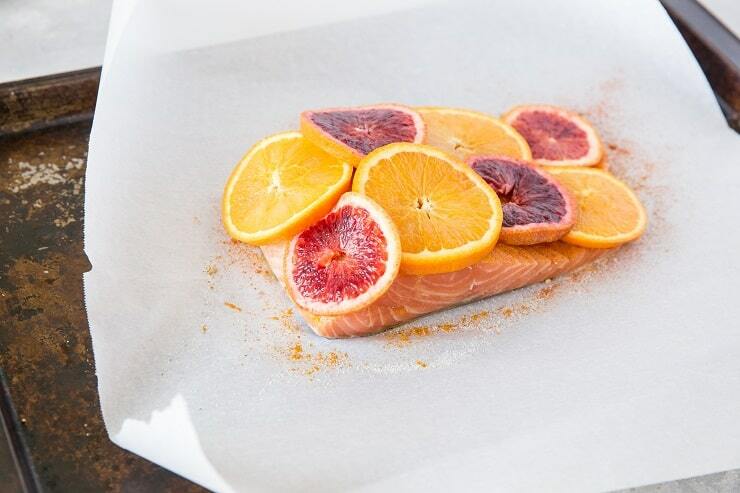 If you make this Parchment Paper Salmon, please feel free to share a photo and tag @TheRoastedRoot on Instagram! Preheat the oven to 375 degrees F. Lay a long sheet of parchment paper on a large baking sheet. 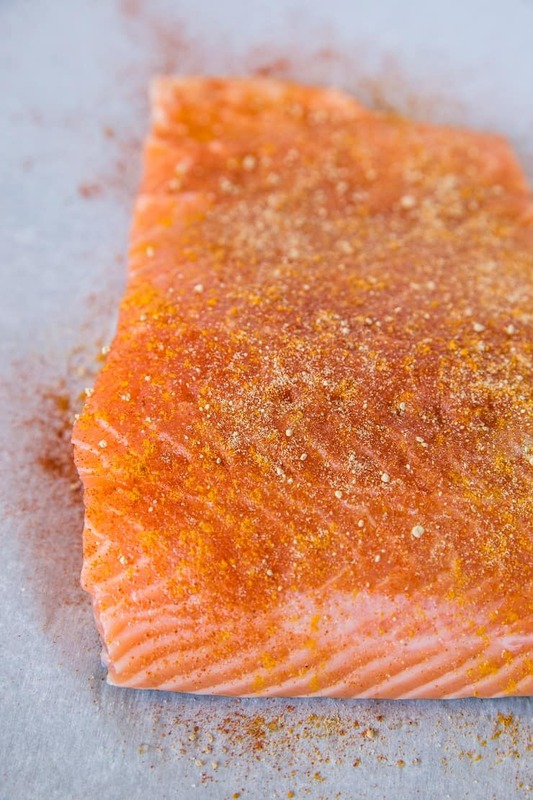 Place salmon fillet in the center of the parchment paper and sprinkle with sea salt, turmeric, ginger, and paprika. 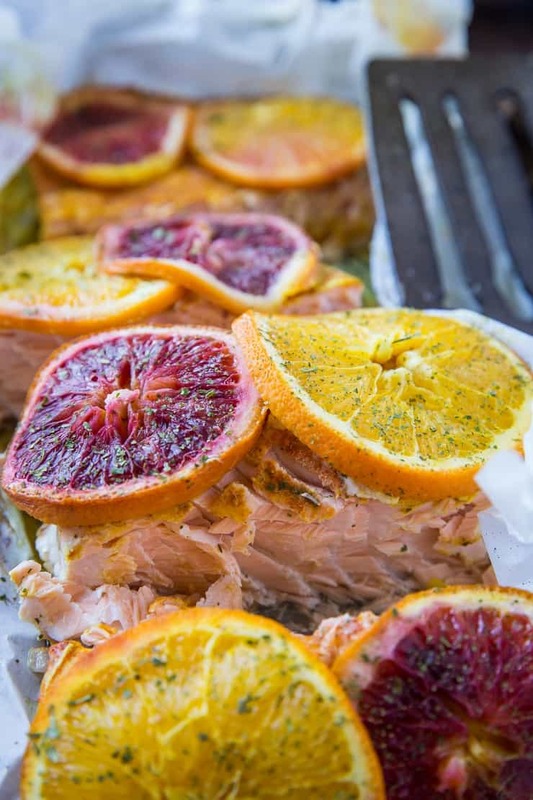 Drizzle the salmon with fresh lemon juice, then layer it with sliced navel orange slices and blood orange slices. Fold the parchment paper over the salmon, creating a packet. 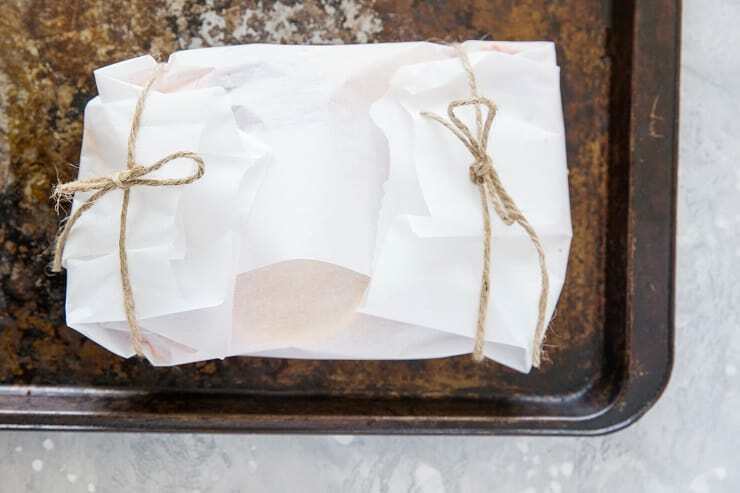 Use twine to tie the parchment paper salmon securely. Bake on the center rack of the preheated oven for 25 to 35 minutes, until salmon is cooked through. Serve with your favorite side dishes, and enjoy! This looks amazing. I eat salmon twice a week and am always looking for new preparations.